On the 7th of April 1723 the Leipziger Post Zeitungen announced that Meissen porcelain wares would carry a mark to guard against forgeries. Forgeries had started appearing and were mostly minor damaged pieces rejected by Meissen. The first mark initially took the form of the letters KPM (Konigliche Porzellan Manufaktur) in underglaze blue. Some years later the Royal Porcelain Manufacture Berlin (Konigliche Porzellan-Manufaktur Berlin – KPM Porcelain for short) was founded in 1763 by Frederick II of Prussia (Frederick the Great). However, when Meissen porcelain marks eventually moved to the blue crossed swords mark, KPM Berlin adopted the Sceptre Mark. 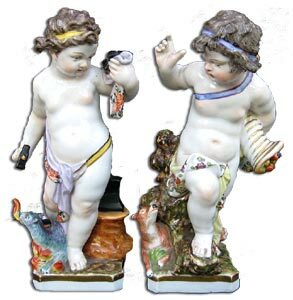 KPM Berlin has produced a wide variety of forms and porcelain figurines throughout its history. Some KPM porcelain designs have hardly changed their shape in over 200 years of production. Frederick the Great once jokingly referred to himself as his own best customer. In more modern times the most successful KPM designs of the 1930s are the Urbino, Urania and Arkadia created by Trude Petri. Porcelain figurines correspond to the style of each era and have always been created under the guidance of the master workshop. These include modern animal sculptures, such as the miniature Buddy Bear and the Bear Knut. KPM (Berlin) porcelain is quite beautiful and very collectible. Collectors should always look out for KPM porcelain figures, vases and centrepieces.